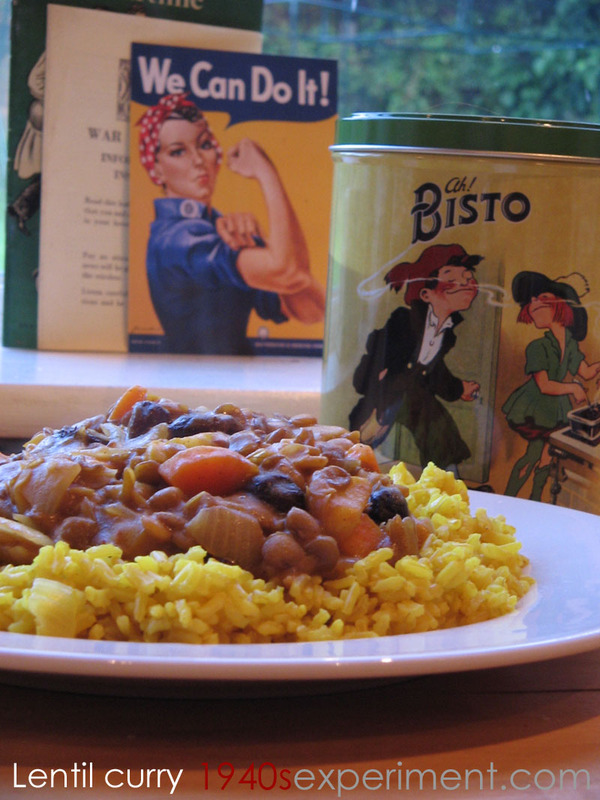 This entry was posted in Uncategorized and tagged wartime lentil curry. Bookmark the permalink. Oh yes ..that’s the one I did!…and very good for me I mostly followed it exactly except threrw in some runner beans that were lurking….it tastes so good Im not sure I will last out till tonight before it all gets gobbled up! I have a suggestion. Try sautéing the curry in the melted fat first, for just a minute or so, before you add any of the rest. I promise this small change of order makes a big difference to the flavour. It sounds lovely and it looks even better. Did you make curried rice as well, or is that just the color of the rice? You can colour the rice golden yellow with the addition of some turmeric in the water. Yes, it’s important to fry your spices to release the flavours, you will be amazed at the difference it makes to the finished article. Rather than use commercial curry powders I buy whole spices then mix & grid to suit the other ingredients for the curry sauce. Grind and store in an air tight jar, in a cool dark place as the light will reduce the strength. For a Balti style (no chilli) mix 2 tsp each whole cumin seeds, coriander seeds, garlic powder and ginger powder then add 1 tsp each turmeric powder, cayenne pepper and salt. To make a Balti for 1 fry a spoonful in hot oil add a tin of chopped tomatoes and any cooked veg you like. Good with fish or chicken, to serve have lemon juice and chopped coriander leaves on the table. Sounds super yummy. I have some lentils that I have been planning to make up as a curry, so will try this instead of your other potato lentil curry. Could you change this. It’s not 2 tablespoons Rice, but ……? Here is a cheating recipe from the store cupboard for Butter Chicken for 2, serve with rice, chapatis or naans. You will also need cold cooked chicken (how much in up to you, vegetables to serve on the side, up to you. Fry the paste till it spits then add the soup & enough water to make the thickness to your liking. Add the chicken, heat through and serve with accompaniments. Nutritional info on sauce only, you still have to add the chicken, veg, etc that you eat with it.